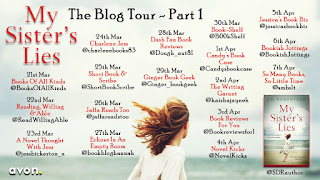 Today is my turn on the blog tour for "My Sister's Lies" by S D Robertson, please check out the other stops on the tour as we all offer different content. An emotional story that delves into the true meaning of family, sisterhood and secrets. Perfect for fans of Kerry Fisher and Adele Parks. The book opens with a suicide so just a heads up as I know this can be a particularly upsetting theme for some people. We don't know who and immediately flip to twelve days earlier, to Hannah our main character. Hannah has finally achieved her goal, has a happy marriage to Mark, no children and happy with her lot. She hasn't heard from her twin sister, Diane, in a long time after a horrendous fight. When Diane shows up on Hannah's door with her daughter Mia she can't turn them away but can she trust her sister and let go of the past? 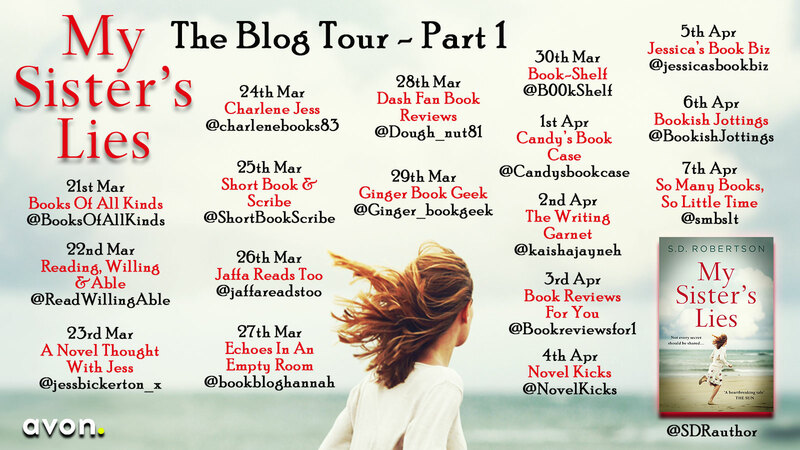 The reader isn't privy to what caused the rift, nor what has drawn Diane to come into her sister's life, she is cagey about the details and wants to leave Mia for a few days to address the trouble in her life. When days pass and Diane still hasn't returned Hannah's husband Mark tries to get some answers but Diane has secrets that will impact on all of their lives, are they ready for it? Oh guys, depending on your own sibling/family situation will impact on how this story affects you. I haven't spoken to my sister just a bit longer than Hannah and Diane had radio silence so I appreciate how something like that can affect you. As the story unfolds and we learn more about the characters I was so angry on behalf of some of them, what a manipulative horrible human being. All their lives the siblings, twins no less, had such different experiences of growing up, Diane the wild child, mocking sensitive quiet Hannah. Diane having the one thing Hannah so desperately wanted, letting her bond and have a relationship only to sever it. Their experiences with their parents, one seemingly favoured, one never pulling their weight. With Hannah being the main character we get a much better grasp of how the family dynamics affected her, their past and her emotional state through her therapist visits (dottered throughout the book). Diane we learn of mostly through the eyes of Hannah so yes it may be a bit more biased but still! Once you absorb the whole story you feel you just got off a an emotional roller coaster, the book examines many themes and in doing so pokes at the reader, evoking personal (in my case for sure) memories and feelings. I read Robertson's debut novel and it is evident the authors writing has gone strength to strength, taking hard hitting themes and weaving them into stories/characters readers can relate to. 4/5 for me this time, I will be buying more of this author and keeping an eye out for their future work.